While bridge has stolen the spotlight in recent years, whist was the game of royalty and gentry in the 18th and 19th century. This game, still very popular, may appear similar to bridge because it involves four players broken into teams of two. While whist is similar to bridge in many ways, it is easier to play, as long as you keep the rules in mind. Court whist is meant as a community game with four players. These players will split into teams, much like teams in bridge, and partners will sit facing each other. The game is played clockwise around the table. To make sure both teams have a hand in the deal, the cards are shuffled by the player on the dealer’s left and then cut by the player on the dealer’s right. While a standard pack of cards is used, it is traditional in court whist to use two packs of cards in rotation with the dealer’s partner shuffling the unused deck and putting it to the left of the dealer. 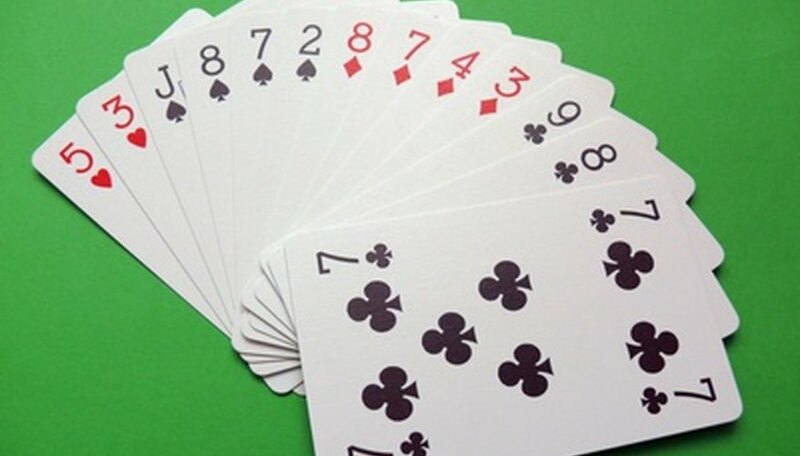 This way, when the next hand is ready to be dealt, the dealer can simply pass the second deck to the right for cutting and the game can continue. The dealer deals in a clockwise fashion, and the player to the dealer’s left leads the first round, or “trick.” Any card may be led and the other players must, working clockwise around the playing table, play a card according to the lead card. If the player has a card of the same suit (spade to spade, hearts to hearts etc.) he must play that card, if he does not, he can play any card. A player wins a trick by placing the highest trump (face card) in it. If there is no clear trump, the winner is determined by the highest card of the suit originally led. Once determined, the winner will lead the next round of play. Scoring court whist is determined after all 13 tricks have been played. At this point, the team with the most tricks scores one point for each trick they won after the requisite six. For example, if the winning team won eight tricks, two points would be awarded to the team. There are different variations on this point rule, including “Hotel Rules” in which the number can be lowered if agreed upon in advance. The first team to reach 20 points wins the game.